Initial funding of $30 million over seven years from the Government of Saskatchewan was announced on March 4, 2011. The Sylvia Fedoruk Canadian Centre for Nuclear Innovation at the University of Saskatchewan (Fedoruk Centre) is a not-for-profit corporation with an independent Board of Directors. Originally named the Canadian Centre for Nuclear Innovation (CCNI), the name was changed October 3, 2012 in honour of The Honourable Dr. Sylvia Fedoruk (1927-2012), who helped develop cobalt-60 radiation therapy for the treatment of cancer and who served as the first female Lieutenant-Governor of Saskatchewan. As a medical physicist, Dr. Fedoruk was the sole female member of the University of Saskatchewan team that first successfully treated a cancer patient with cobalt-60 radiation therapy in 1951. The device and techniques Dr. Fedoruk helped develop are used to this day to treat cancers around the world. Daily, more than 45,000 radiation treatments are delivered in more than 80 countries. Dr. Fedoruk was also the first female chancellor of the University of Saskatchewan, first female member of the Atomic Energy Control Board of Canada, and a member of both the Canadian Medical and Saskatchewan Sport Halls of Fame. She was an Officer of the Order of Canada, a Member of the Saskatchewan Order of Merit and a Dame of the Order of St. John. Fedoruk Centre is incorporated under the Canada Not‐for‐Profit Corporations Act. This choice addresses the Fedoruk Centre’s purpose to place Saskatchewan among national and global leaders in nuclear research, development and training, symbolically establishing from the outset that the Fedoruk Centre reaches beyond provincial boundaries. The Fedoruk Centre is solely owned by the University of Saskatchewan as a Type-C centre of the university. While the Fedoruk Centre is situated on the University of Saskatchewan campus and uses many of its services, its mandate is to serve all of Saskatchewan. 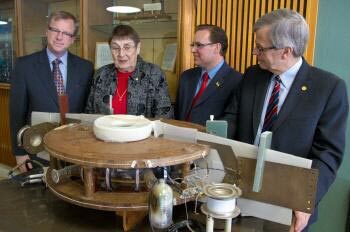 Premier Brad Wall, Dr. Sylvia Fedoruk, Saskatchewan Minister for Innovation Rob Norris and USask President Peter MacKinnon view a betatron particle accelerator built at USask in the 1960s for plasma research.